1. What drove you to create Popcorn Shed? My cousin Sam and I discovered gourmet popcorn during a trip to the US, and on returning to the UK we realised that great tasting and high-quality popcorn was not easy to source and spotted a gap in the mainstream market. We had always flirted with the idea of running our own family food business together, and in a moment of madness around our 30th birthdays, we had a “now or never” moment. 2. What's the biggest lesson you've learnt from starting up Popcorn Shed? That creating a brand and business is not a static thing. You don’t just launch and that’s it. You need to be nimble and constantly reacting to feedback and adjusting to improve. Talk to everyone and share your idea. Feedback and advice is invaluable. There is a tendency for people to feel like they don’t want to share their business idea for fear that someone may steal it. However, unless your idea is so revolutionary and the barrier to entry is very low, it is very unlikely to happen! Be bold and just do it! What’s the worst that can happen? I always say it’s ok to try and fail but it’s not ok to not try. I’ve definitely had my moments! But running your own business has high highs and low lows so you learn to become resilient. I don’t think giving up is really in my blood. 5. As cousins, does this bring up complications in your business relationship when it comes to making decisions? We’re very close, more like brother and sister so although we do fight, it’s never personal. It’s always for the good of the business. I think running your own business has enough stresses so having a business partner who you can fully trust and rely on is a must. We have complimentary skills but the same work ethic so it works very well. There have been so many! I think for me it was getting our first fan letter. My father. He is a very hardworking man who was the first professional in his family and now runs a very successful business. 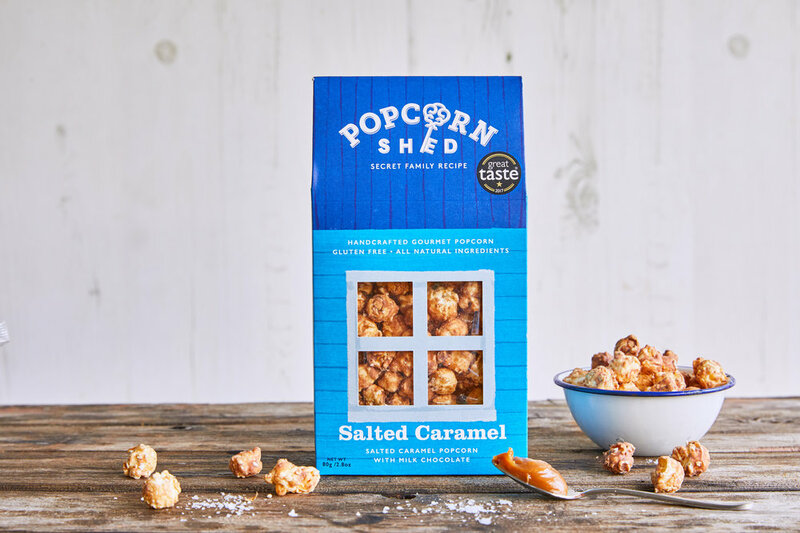 Popcorn Shed is all about enhancing those sharing moments that matter so hearing how much customers love the taste of our popcorn and our brand keeps me buzzing. 9. What other entrepreneurs do you look up to? Two other female food entrepreneurs who I really respect are Camilla Barnard and Pippa Murray. Camilla is the founder of Rude Health (the healthy eating brand). They started their business with no food background in their kitchen and today they have a huge range, stocked nationwide and she launched it with 2 young kids! I also think that what Pippa has achieved with her nut butter brand Pip and Nut is incredible and she isn’t even 30 yet! Hmmmm… probably what I was doing before- digital project management, making sure you can subscribe for binge TV and keeping your online banking working (most of the time! ).